What are the Top 10 City Center Luxury Hotel Pools? While it's easy to find amazing swimming pools in resort locations, space constraints and high rents in urban locations make it more challenging for city center hotels, even luxury hotels, to boast swimming pools. Whether you need a pool for your daily workout or just want to relax in the water after a day of meetings or sightseeing, here are my picks for the top city center luxury hotel pools, taking into account the hotel location, quality of the hotel, and the pool. 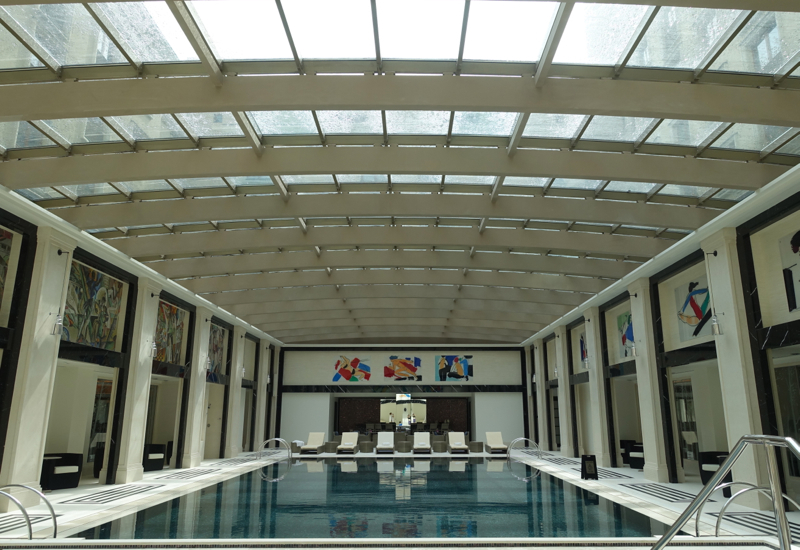 While there are quite a few Hong Kong luxury hotels with pools, some indoor, some outdoor, the Four Seasons manages to have both an outdoor lap pool and a large main pool for casual swimmers and families. This solves the usual issue of lap swimmers getting frustrated by those wanting to simply relax or play in the pool. Plus, the pools have a lovely view of Victoria Harbor, and there's great Four Seasons pool service to boot. 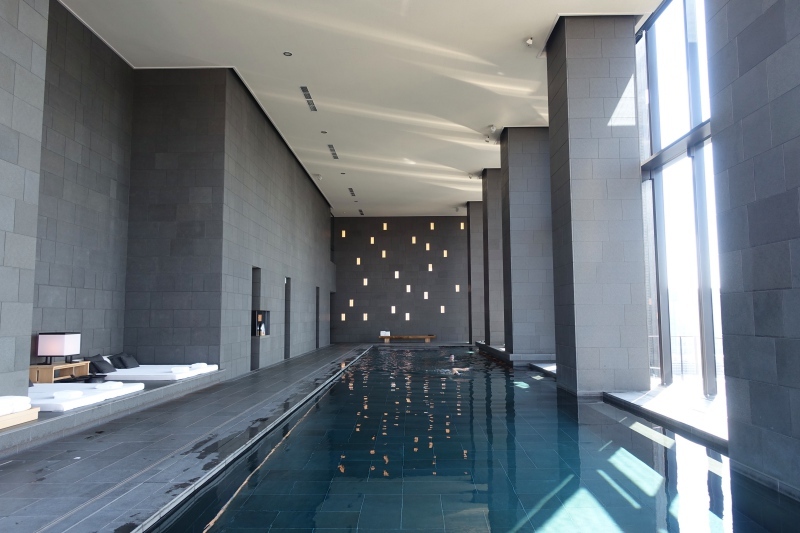 The Aman Tokyo pool is nearly 100 feet long and located on the 34th floor, giving it superb Tokyo skyline views. Couple this with the fact that it's rarely crowded, and it lives up to its name (Aman means “peace” in Sanskrit). I know, you're probably thinking, what about the Marina Bay Sands Infinity Pool? No question, the views from that pool are incredible, but…consider how overcrowded that pool is, and the fact that the rest of the hotel doesn't live up to the hype. Which brings me to the Fullerton Bay. If you truly want a luxury hotel experience in Singapore, with great rooms, service, dining, and an outdoor pool that isn't overcrowded, stay here. The Shard is somewhat controversial among Londoners, given its extreme height and the way it changed the London skyline, but if you're staying in it, that height is a plus. The hotel's lobby is already on the 35th floor, but the infinity pool, with its panoramic views of London, is on the 52nd floor. Just note that this pool tends to be fairly crowded much of the time. Four Seasons Moscow easily has the best city center location, if you're planning to visit Red Square–it's right next to it, and is also close to the Bolshoi Theater and Tverskaya, the main street in downtown Moscow. Instead of being in the basement, the pool and spa are on the 5th floor, and the large pool has a glass atrium ceiling such that it's flooded with natural light. Truly one of the most gorgeous light-filled indoor city center pools I've visited, and usually not crowded. While this is not a pool I've personally been to yet, clients have enjoyed the pool, 59 feet in length, and jacuzzi, which, together with the spa, are on the 41st floor. For a special romantic celebration, why not reserve the pool to yourselves? It's possible, as a Four Seasons Extraordinary Experience, from 11pm onwards. While the Mandarin Oriental Bangkok and The Peninsula Bangkok are better known Bangkok luxury hotels, a more boutique and resort-like experience awaits at The Siam, with just 39 suites, the smallest of them 1100 square feet. It's not uncommon to have the hotel's infinity pool, located riverside, entirely to yourself. Los Angeles can be stressful. Even as someone based in NYC, where traffic seems to get worse every year, I find LA traffic horrendous. That's where a nice hotel pool comes in, such as at The Peninsula Beverly Hills. No, it's not a huge pool, but it's still a lovely respite, and there's wonderful light bites and drinks on offer as well, many of them with ingredients from the hotel's own roof garden. If staying soon, before the end of October, don't forget to take advantage of the AMEX Offer of $100 Off $500+ at the Peninsula Beverly Hills or New York, or the new offer which is even better: 10,000 AMEX Membership Rewards points for $500 or more in spend at the Peninsula Beverly Hills or New York. The Park Hyatt New York doesn't have the Central Park views of the Mandarin Oriental New York or the Trump New York, but it does have a newer and nicer pool, with soaring ceilings and great natural light. Since this hotel is popular with families, aim to go early or late and avoid school holidays for your best chance of a less crowded pool. There are several excellent Paris luxury hotels with pools, including the Four Seasons Paris George V, The Peninsula Paris and the Shangri-La Paris. But, while the Le Bristol Pool is rather small, I like that it enjoys natural light from the windows and even has a small outdoor terrace, from which you can see the Sacre Coeur in Montmartre. What are your favorite city center luxury hotel swimming pools?